That’s why this DIY is such a relief: With two kitchen cabinet ingredients and five minutes, you can start the skin lightening process to naturally reduce dark spots for good. This is one of the easiest natural beauty DIYs I’ve ever tried, and trust me, it really works! I know what you did this summer, and you should have worn a bigger hat. How? The dark patches are in fact hyperpigmentation, a sign of sun damage caused by an increase in melanin production, which happens when the skin is trying to protect itself from overexposure to UV rays. And the only way to truly reduce dark patches is to exfoliate regularly: Removing surface layers of damaged skin will lighten dark spots over time, as new skin replaces damaged skin. Lemon, a natural exfoliator, comes into play in this skin lightening treatment. After cleansing, slice open a lemon, hold one half by the rind and rub the juicy side all over your face, being careful to avoid your eyes. The alpha-hydroxy acids (AHAs) in the lemon encourage exfoliation by sloughing away the outer layer of dead skin cells, improving circulation and stimulating new cell growth. The fruit acids dissolve the old skin cells and making room for the new. Leave the juice on for five minutes or less—much less, if the stinging is too much—then rinse off. This treatment is even more effective in a steamy bathroom or sauna. But you don’t just want to reduce brown spots, you want less end-of-summer dry skin wrinkles too, right? After your lemon exfoliation, take a minute to slather some raw, organic honey on your face. A natural humectant—that’s something that draws moisture to the skin—honey has antiseptic qualities as well, which means it helps to clear up breakouts. Bonus! After a few minutes in this natural beauty mask, you’ll notice the difference—just don’t give into the temptation to lick it all off. 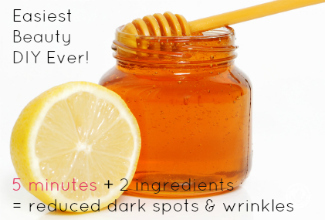 Leave the honey on for as much as 20 minutes, then rinse off to feel soft, hydrated, glowing skin. With regular use, this two-step treatment can improve skin texture, as well as reduce brown spots and wrinkles—but only if you continue to protect your skin from the sun. Wear a physical (not chemical) SPF every day, even when it’s cloudy. Right now, I’m loving Juice Beauty SPF 30 Oil-Free Moisturizer, which has a very sheer, natural tint. Oh, and keep a hat handy for sunny days. With a bigger brim than mine! Editor’s note: We’ve had many inquiries about skin lightening products that can be purchased, rather than DIY’ed. In response, I wanted to share two great natural skin lighters that I discovered. First is the vegan Fruit Acid Gel Peel from [re]fresh Skin Therapy, with lactic and kojic acids. A little less expensive is Retseliney’s Dark Spot Corrector Cream , which calls on kojic acid to lighten and hyaluronic acid to hydrate. Both products eschew hydroquinone, parabens and phthalates, artificial colors and fragrance, and artificial preservatives. Take a look and if you find a natural skin lightener that works for you, please leave me a comment. Thanks! Please can I use lime in replacement of lemon? Honey and Lemon is best agent for Skin lightening properties. I am using it since 1 week, really its amazing, i am very happy now. thanks for your book article. I have tried lemon for my dark spots and it has worked in the past but I had a really bad breakout a few months back and it hasn’t been working as well. Do you think something like the Tonique 10x lightening natural cream will work for me? I am 16 years old …and i am having dry skin. I have a complexion that is not so dark. Most of the home remedies i have used leaves my skin tooo dry that a sort of white powder appears on my face. Every one use to tease me a lot in my school by seeing my face with dark spots .I bought DermalMD Lightening Serum and applied twice a day for a week .My face looks very bright without any dark spots and I was really happy .This product contains no chemicals and made with all natural ingredients. Add colour to your life..don’t miss it. Hey ! my arms , legs and especially my face is tanned but my body is white . Can you help me with this ? Reply me as soon as possible ! I tried honey, it worked, for a while though. After some hours, my face became filled with rashes!! Really, wow! I’ve never heard of that happening. Sorry Ije! Did you use raw honey or processed honey? Raw honey is much more beneficial! hi, I have a very dark face but my body is light, intact people cal me two color girl. wat do I do to make my face ryhm wit my body. Hi, can i pls apply olive oil on my face after applying n washing off lemon in treating acne? I know people who use oils to treat acne, but I haven’t heard anything about using olive oil. Let me know how it goes if you try…! I got a tan but on my back and chest and stomach areas. It’s unusual and unlikely cause those areas are not really exposed to sunlight. Do you think lemon and honey can help cause it’s really embarrassing. I can’t pull of my clothes anywhere outside my house. I’m really desperate, but I don’t wanna use hydroquinone products because of the side effects. If there’s anything more that I can add to quicken the process please let me know. Thanks in advance. I would recommend staying away from hydroquinone, using the exfoliation and being patient 🙂 Good luck! I used a TCA chemical peel on my skin to clear up old acne scars, it did visibly clear my skin but left a dark patch on my left cheek, will using lemon and honey combat this dark patch too? You should try it! Let me know how it goes. Thanks for commenting! Im 19 years old.my face s darker than body due to explosure to sun since childhood.i tried Skinlite 2 years ago.it gave my face a really lighter skintone.but it became more darker again when i go out in sunny days. Our skin changes as we age, that’s something we all have to accept. Just try to avoid products with hydroquinone, which can make your skin extra-sensitive to the sun, keep using sunscreen and gentle, natural exfoliating products. Good luck, Melvin! Just start using DermalMD Skin lightning serum for about two weeks. The skin did look lighter and the dark spot is lighter too. Skin is more moist but I was using some masks at the same time. I think that helps with the moist of the skin. Will see what happened if continue using it. Thanks Caroline! That product seems to get great reviews from customers, and I like that it doesn’t contain hydroquinone. Thank you for sharing! Pls does honey cause more acne break. No honey is an antibacterial with no oil, it will not cause more breakouts. Good luck Christabel! Hi Rachel, is manuka honey too strong to use? No it’s perfect! So many other benefits, too. Let me know how it goes!! I don’t know about Retin A, I would recommend talking to the dermatologist who prescribed it? Good luck! OH I love this idea! Will have to try. Thanks for sharing your tips, Hira! DermalMD Lightening Serum is the product I have found to lighten my melasma. It’s been almost 6 months but I specifically used it on one area and not another….glad I did so I could see the difference but wish I had trusted it. I’ve spent lots of money trying different things and nothing worked except this. Hm… I wonder what the active ingredients is in that. My concern is that most contain hydroquinone, which is not only super toxic but when you go into the sun again it makes your skin even MORE sensitive! I’d love to know what the active is on your product. In any case, thanks for sharing! Is it okay to not rinse off the lemon juice and just leave it overnight on my face (if I don’t experience any irritation)? Your thoughts will be appreciated! No you should definitely rinse it off! That’s an interesting post! Can this method be used for lightening also arms and chest? I’m naturally pale but I’ve been under some sun exposure this summer without sunscreen and I can notice a line on my chest and I really want to keep being pale. Dermalmd is Awesome moisturizer and serum for my face. If you need something that feels light but does the job, this product is it! My face looks natural and glows and I give all the thanks to this product! This is a must buy. Thanks for sharing! Is it paraben and petrochemical free? I am fair skined naturally, my skin tone is even through out my whole body except for my fore head and neck will this procedure give me an even skin tone naturally. That’s my question. Thanks for reading, Emmanuel! This treatment is designed to gently exfoliate the skin. I find that if I regularly exfoliate and wear sunscreen I see a gradual lightening of the skin where I have darker patches. Good luck! Rachel it seems like you don’t reply everyone. I’ve posted a question twice and you’ve not answered any of them, but you’ve already answered other people’s post. I don’t know why. Am I invisible. So sorry Emmanuel, this is the first question I’ve seen from you. How can I help? Try to use DermalMD Serum for Make Skin Lighter it’s very effective. It is on the strong side, so be cautious on lighter more tender skin. However, I think it is very good and use it every other day. The darker sun spots on my cheek are lightening very quickly and I am very happy with this product. I don’t know that brand, what’s the active ingredient do you know? Thanks for commenting, Julia! I went to the store and bought honey but I bought pure honey. Is that ok to use on the skin? Someone please help. Hey guys, this is Shubham here. I am just 15 but really tired of my dark tanned face and especially, my forehead. You all wouldn’t believe I was quite fair when I was around 10-11 years. Over the period, due to much outdoor sports like football and cricket in summers gradually made my face, tan a lot. I didn’t care at that time but now, facing the consequences. It’s a very bad and severe tan on my face which is not going whatever therapies I tried. Can you help me out. I want my childhood complexion again. Even lemon and honey didn’t work out in this case. My mom refuses for artificial bleaching. What do I do ? Hi Shubham, the best way to reduce sun exposure is to wear a mineral-based sunscreen daily and a hat when you’re outside. Please stay away from chemical bleaching products, they will only make your skin more sensitive to the sun during exposure, and they’re linked to some pretty nasty illnesses. Face and hands.what u think about this.And I am doing this everyday. Thanks plz let me know. How long do you have to do this before your skin actually lightens? i want to get my body colour on face and neack….What should i do…plz HELP me…..
(my frnd got amazingly white colour within 2 months.he was darker than me,he said he used skinlite bt his color is not fading yet)…. Hi Melvin, I’m not sure what Skin-Lite is but look at the label: If it includes hydroquinone then it may make you MORE sensitive to the sun. Good luck! I am interested in the lemon exfoliating skin treatment/along with the raw honey moisturizer for the skin. How often are you to do that? I try to do a facial once a week, but not necessarily always this one. Let me know how it works for you! I was wondering if a therapudic grade of lemon essential oil would work for the dark spots ? Sorry in advance if this question has been asked already ! I don’t know about that, actually. Thanks for reading! I’ve noticed that after I shave the skin underneath the hair is darker then the rest of my face can these home remedies be used to lighten and even my skin tone as far as the skin where the hair grows? I don’t know if I’ll get a reply after so long, but I was wondering.. can the lemon help to fade a suntan? I went out with no makeup and had JUST exfoliated my face. My outfit covered every other inch of skin from the sun. Now my face is much darker than everything else and it’s been a month and it hasn’t faded AT ALL =( Help please?! I think exfoliating and staying out of the sun are both great techniques, and the lemon can definitely help with the first part! I have having my face itching skin i read about honey which i used and i realized an improvement in the skin. but a friend of main recommended adding of a lemon juicy which i did yesterday. how best can i use this because i fast applied lemon juicy after few minutes i added raw honey. pliz advice i do love your article. Thanks for reading Mary! For itching, I think raw honey would be a great thing to try. I wouldn’t add lemon for that purpose. But yes to honey! Let me know if it helps? I have browish/black spots on the back of my legs would lemon juice be able to lighten it up ?? The lemon is very gentle and can be used anywhere, give it a try! But the results are gradual, not immediate. So after you stop using the lemon treatment is it possible to stop using sunscreen daily, or should you keep using it the rest of your life? Besides the fact that sunscreen is good in general. Yes I think daily sunscreen is a great idea! Hi Rachel, I just came across your post and am super excited about it as my face has been gradually sporting dark spots more and more with each pregnancy I’ve had… I try not to care but if any sun hits them they are blaring and I really don’t like them. I saw one comment ask about lemon juice instead of lemon… would this be the same or do you think the juice has oxidized and may not be as good? I ask because I have a large bottle of organic lemon juice already…it would save me time/moola. Also, I saw a post about using Vit C powder… I also currently have that. If using a lemon and slicing is best I’ll do that, but if you think the juice or Vit C powder may work as well (since I already have both) I’d like to know your thoughts. Thanks much dear! Thanks Hunter! I appreciate your comments. I think it would be best to use the cut lemon, because 1. it’s fresh and 2. it’s easier to maneuver over your face 🙂 I am going to experiment with the powder, though. Stay tuned!! Let me know how this treatment works for you? Thanks! I am being very greedy ! 😉 ..
Hi RoSalyn! I think it should, and the honey is definitely softening and smoothing for all skin types. Let me know how it goes! to an integrative pharmacy today in search of something natural, but the product I was encouraged to purchase irritated my skin. As an ethical vegan for 39 years, I don’t use any animal ingredients or byproducts, so honey is not an option for me. Is there any alternative to honey that you might recommend? Hi Robert! Yes, I see the conundrum. I think you should look for an aloe based product. Aloe is soothing but not animal based. I also like argan oil, which is also vegan–the one I use is here: http://www.mommygreenest.com/mommy-greenest-approved-josie-maran-pure-argan-milk/–for more hydration. And the fruit acid exfoliation is the skin lightening part, so that you can still get from lemons. Let me know if this helps? Thanks for reading! I have been suffering from skin TB and it left my legs with dark black spots what can I use to remove or lighten them up? Something natural since my skin is very sensitive. Its too bad that I don’t even wear skirts or anything that shows my legs. I would really appreciate it if you would advice. Is it wise for me to buy honey from a shop? I have been using bio oil but there is just no improvement! I’ve used lemon and honey for dark patches from sun exposure, but I would suggest that you talk to your doctor about anything related to a medical condition. Thanks for reading MG! Absolutely that’s one of my favorite recipes! I also like this one, which adds egg and oatmeal to the mix. http://www.mommygreenest.com/4-ingredient-diy-organic-face-mask-recipe/ Let me know if you try it! My face and hands have darkened due to sun exposure for years, i never used sunscreen before. I use sugarcane juice as it contains Glycolic acid, Lactic acid from milk or yogurt or Lemon for ascorbic acid. And i am using it every day either of the one mentioned above for fast result. Is Honey better than all these? Will i get fast result if i use it everyday? Hi Supreya! I think you should have your foot looked at by a doctor. And as for complexion, this facial is about lightening the brown spots that are caused by too much sun. So hopefully you will use sunscreen in the sun to prevent those when you’re older. Good luck! i can i use honey every alternate day ?? is there any sideeffect ?? as i have so many scars on my face and i want it to be fixed ASAP. Also keeping honey overnight is more beneficial ???? Thanks for writing! I don’t see any downside to using honey every day, but overnight might get sticky 🙂 I try to do it once a week. please suggest if i should stick to it ? Oh, I’m so sorry! I don’t know if honey will completely fix acne and acne scars, but have you seen improvement in skin texture and color? I hope so! Also, maybe try once a week as a facial, rather than every day. Please check back and let me know how it goes! What a great testimony to the power of natural ingredients, Joy. Thank you SO much for sharing! i have a super oily skin and pimples too , not sure if honey is good as it may darken the skin texture ???? I don’t believe that there are any skin darkening properties to honey, but doing the mask weekly should improve skin texture. Let me know how it goes? Thanks for reading and sharing! Even cheaper and easier is this: At the natural foods store, buy a very small quantity of unbuffered ascorbic acid powder (vitamin C.) It is very inexpensive. Gently cleanse skin with a mild soap such as Dial Basics Hypoallergenic. Mix a small amount of the powder, about 1/4 teaspoon, in 15 ml, about 1/2 ounce, cool or lukewarm water until dissolved. Wipe over skin with a cotton ball. You should feel a slight tingle. If not, try a slightly stronger mix, perhaps 1/2 teaspoon powder. Leave long enough to evaporate. Then wash with the soap again, scrubbing gently with a buf-puf-type scrubber. The ascorbic acid works as well as the citric acid in the lemon but is much cheaper. Other cheap beauty solutions in my Custom Wardrobe book. I like this, but I think the lemon is easier–and cheaper, especially from a tree! Do you need to rinse the lemon off before applying the honey? Or, do you apply the honey on top of the lemon? Thank you for the info. How many times a week do you suggest using the treatment to see progress? I think it depends on your skin and what you’re looking for, but I think weekly is a good place to start! I’m a huge (raw) honey fan too! I put it on my face in the shower or when I have breakouts I dab some honey on my face before bed. I recently healed a 2nd degree burn with honey at our family cottage. I wrote about it on my blog! Honey and lemon are great for skin! Years ago, I bumped into a hot light. Now I have a dark pigmentation on my back. I was given a cream to lighten it. I wonder if repeated lemon treatments would help. Love the honey idea. I use raw local honey. It would be good for your face and your fall allergies. I use raw honey too, and was just reading about the connection between local honey and fighting allergies. Love it! Thanks for writing, Mary! I would wash it off before you sleep, could be sticky! Perfect timing! I went out on th boat for 6 hours without my sunscreen and have awful malasma. 🙂 Off to get a lemon. Oh no! Definitely use the honey, too. That can really help with dryness. Let me know how it goes!